Last week my friend Courtney and I went to see the new Helmut Newton exhibit at the Palazzo delle Esposizioni. There are two hundred photos covering three legendary books by Newton. This blockbuster show runs until July 21st. Newton forever changed fashion photography and is considered one of the most influential photographers of the modern era. Many copy his style, but few have his talent. It was incredible to see all these iconic photographs in person. 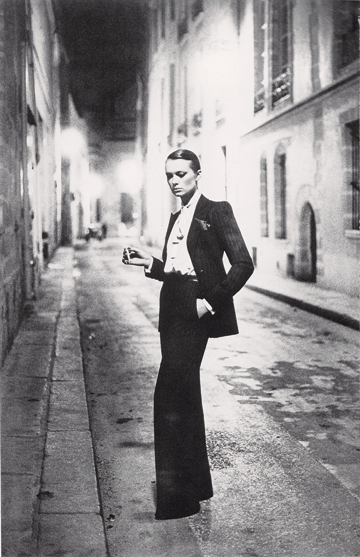 This one was shot for VOGUE in 1975. My friend and I left the show very inspired. Newton was passionate about life and his work. He was shooting until the day he died at age 84. His first book of photography wasn’t published until he was 56 years old. By Hollywood standards that’s close to 100. I’ve worked for years in culture that was/is obsessed with age and making it. I had friends in L.A. who started getting Botox in their 20’s and I’m not talking only about actresses. I loved this exhibit. I love that he found success at 56. I love that the women were strong and compared to pictures today, natural. I read Newton really disliked fake breasts and refused to shoot models who had them. Yes, it was almost jarring to see nudes of women who haven’t had Brazilian waxes. Some of his work was very controversial but I too see the women as strong and in control. It’s not about the male gaze. Previous Previous post: Thinking About Orange.